Do you ever wonder why you aren’t getting the results you think you should? Vernon Budinger has found that people often have bad habits that convey a lack of confidence and destroy any passion in their message. 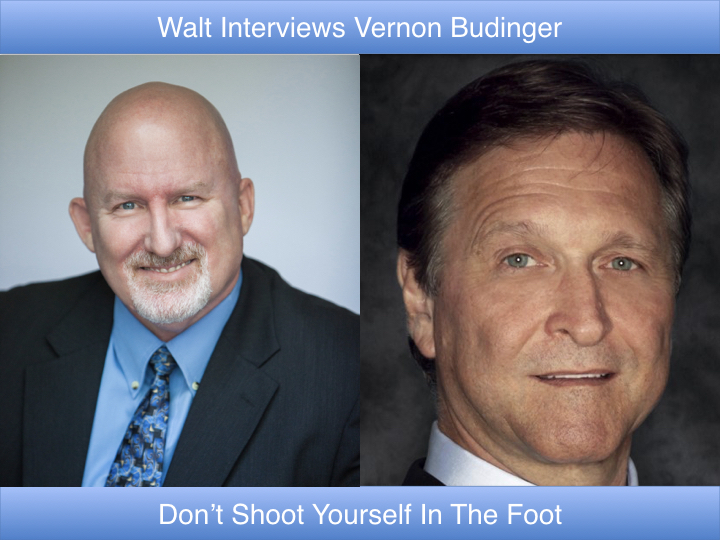 They literally “shoot themselves in the foot.” Vernon Budinger has worked in the finance industry for almost thirty years. He received his MBA from New York University with Distinction. He then went to work on Wall Street for Citicorp Securities Markets. He earned his Chartered Financial Analyst designation and went on to work for hedge funds (specialized, higher-risk investment funds). Vernon left his most recent employer to start his own hedge fund to invest in Brazil. He soon found out that promoting hedge funds is much more difficult than building one. One day he watched a video of one of his presentations and realized that, based on the presentation, he probably would not even invest in himself! That is when he joined Toastmasters and got serious about speaking. He observed that some investment managers were successful in finding investors, even though they did not have the best presentation or the best investment process. He researched the components of confidence and passion that lead to successful sales. He learned that people often have bad habits. These habits convey a lack of confidence and destroy any passion in their message. Through experimentation, he found that the best approach for eliminating the bad habits was to substitute good habits and start by mentally “pretending” that he had always had the good habits. Some folks call this “Fake Until You Make It.” Amy Cuddy, a famous behaviorist that taught at Harvard, called it “Fake It Until You Become It.” Vernon thought that this was a bad name for a great idea. His approach is to learn to behave so you don’t shoot yourself in the foot and destroy the confidence and goodwill that you have built up with the audience. His approach came full circle when he saw Tom Iland speak. Tom was diagnosed with autism when he was 13 years old. Instead of living as a behavioral outcast, he replaced his bad autistic habits with good habits. Vernon realized, that we are not becoming someone else when we eliminate bad habits, like Tom Iland, we are discovering our real self, the self that can connect with people is a real way.